On March 21, 2019, the Provincial Parliament in Manokwari ratified a Special Provincial Regulation making West Papua the first conservation province in Indonesia. The passage of this regulation places sustainability at the center of development planning in one of the world’s most biodiverse places. 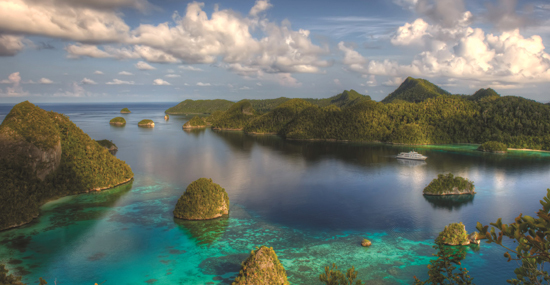 West Papua sits on the Bird’s Head Seascape in the center of the Coral Triangle, and is home to nearly 2,000 species of fish and 75% of the world’s hard corals. CSF is proud to have played a part in this victory for conservation. In 2016, we partnered with the Working Group on the West Papua Conservation Province to conduct a scenario planning workshop. Through this process, we established a shared vision of the future among stakeholders and generated policy and technical inputs. As a part of that workshop, participants had an opportunity to review the draft version of the Special Provincial Regulation and provide their comments. That feedback was shared with the planning staff and legal bureau of the provincial government, and incorporated into the five year development plan of the province and the final version of the Special Regulation. The ratification of this regulation cements West Papua’s commitment to preserving biodiversity, maintaining ecological balance, managing natural resources wisely, and creating sustainable livelihoods for it’s people. It also stands as an example for other Indonesian provinces, and the world. Congratulations West Papua!